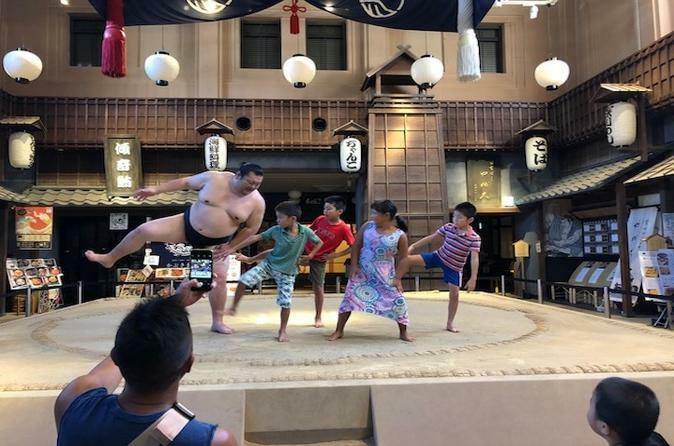 With this tour you can experience standing on an actual Sumo ring and face off with an ex-Sumo wrestler. Sumo is a popular sport in Japan, however there isn't much chance for people to stand on a real Sumo ring. This is also the first time where women are allowed to stand on the Sumo ring as well, due to traditional reasons. With this tour you will be given a lunch or gift ticket, which you have the choice from 11 stores to choose from. Don't care for lunch? You can exchange your ticket for souvenirs, making this tour for people with less time as well. Join this tour and stand on an actual Sumo Ring and face off with an ex-Sumo wrestler! We offer you an exciting chance to interact with sumo wrestlers!! You will be able to learn the basic rules and regulation and also the daily life of a Sumo wrestler and their struggle to reach the top. This is a very rare opportunity that you don't wan't to miss out. Sumo is a national Japanese sport and part of traditional Japanese culture. It is believed that the origin lies in the mythical age. Sumo has been familiar with Japanese culture and the lives of many people. Sumo has many faces such as historical, cultural, Shinto ritual or athletic, and each of them has a particular feature. Also what makes this tour even more special is the fact that children and women are also allowed to stand on the ring and join the experience. In the Sumo world, women were never allowed on the Sumo ring, and this had been a huge topic in Japan. However with this tour anyone can stand on a real Sumo ring! After the performance and your heroic act of wrestling with a Sumo wrestler you will be able to go to any of the 11 stores that are in the "Edo NOREN" area for lunch. You will be given a ticket which you can choose 1 meal from any of the 11 stores below. *Some restaurant might be closed depending on the date. If you don't want to have lunch you can exchange your ticket for souvenirs or for Japanese sake as well!